I had been planning on getting another tattoo with my friend Audrey for awhile, and when we planned to go on a road trip to New Orleans for her birthday it presented us with a perfect scenario. We didn’t know exactly which tattoo shop we wanted to go to once we got down to New Orleans, but ended up stumbling (not literally, we hadn’t anything to drink yet) into the perfect place, Electric Ladyland Tattoo, a great tattoo shop in a cool area on the edge of the French Quarter. Scott Barbier was our artist and couldn’t have made the process any better. 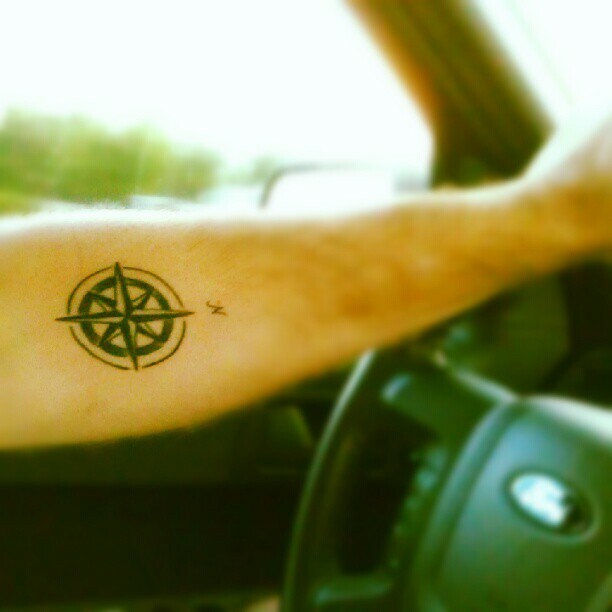 Audrey had her tattoo down and I knew I wanted a classic compass, but hadn’t exactly figured the exact design. Scott took my ideas and created a great piece and I couldn’t be happier with it. What is your tattoo design and why did you chose it? There are many reasons for choosing this piece, from learning orienteering using a compass when I was a scout to traveling around the world to camping and hiking in the mountains a compass fits my personality and what I enjoy most. My experience at Electric Ladyland Tattoo was top notch, from walking through the door till when we exited the shop, it was amazing. Although I loved drinking many beers from Abita while I was in the Big Easy, I am from Chicago and have my all time favorite beers close at hand. Half Acre, Metropolitan, Piece, Pipeworks, Revolution among others make such great beer here, but my favorite beers are out of Goose Island. I’m a sucker for barrel-aged beers, and nobody does it better than them. I love Bourbon County Stout, and will drink it any chance I get. Every version they make is amazing and full of flavor with that distinct bourbon taste. It is definitely a treat when it is released and always have to set a few aside for special occasions. Can’t wait till I run into it again on tap again somewhere in Chicago, it is always a welcomed friend. Previous Post Craft beer and dancing?! I’m in. Next Post International IPA Day is coming on August 2!